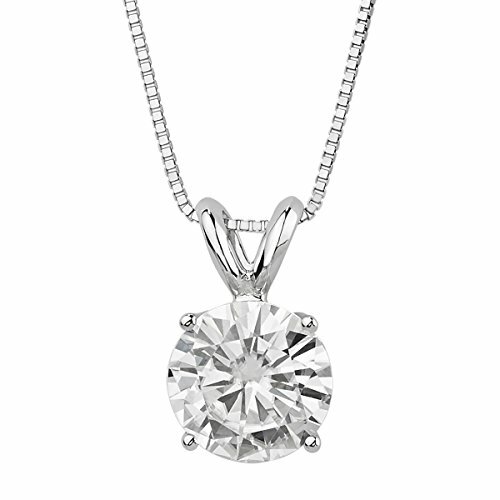 Radiating with simple beauty, this round cut Forever Brilliant Moissanite pendant is a lovely look for every day wear. Classic and charming, this traditional necklace features a glistening 6.5mm round brilliant cut Moissanite solitaire gemstone perfectly polished in gleaming rhodium-plated 14K white gold, this necklace suspends from an 18" chain and had a lobster clasp. The round brilliant cut 6.5mm moissanite and has a Diamond Equivalent Weight (DEW) of 1.00ct (Actual Weight 0.88). The round brilliant cut 6.5mm moissanite and has a Diamond Equivalent Weight (DEW) of 1.00ct (Actual Weight 0.88).